Located at the stated Paris end of New Farm’s Merthyr Road, Vine has been a celebration of fine dining and good company for a very long time, opening in 2005. We heard it said, that little has changed in all of that time. This closely knit family has gone about providing a great gastronomic experience for all who go there, whether it be to a robust lunch or to the sumptuous dinner. And for us, the almost casual way, the right way, their patrons are greeted and treated, is something that brings us back to the place, time and again. 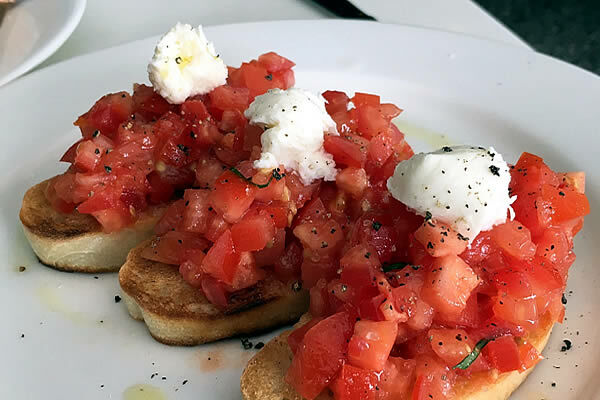 VINE were recent winners in an expansive Bruschetta competition run by NFP, and featuring 14 other quality eating places, both here in NF, close by and even an international entry. The night when the Judges met the Winners was something quite special, as is the Bruschetta.